This page will give you an overview of the main sections of Lettuceshare. Follow the link under each section to learn more about it. Every account created on Lettuceshare has it's own home page, which displays a summary of the member's account. The home page can be customised to display information specific to your group. If your group pre-orders, then the home page will display a link so that members can place an order. This page is called the purchase page, it is the main page your members will interact with in the system. As well as ordering, it's also used by volunteers when produce arrives to weigh and pack boxes for members. There are links to the purchase page from a members home page, but you can also access it via the page select menu in the control bar by selecting purchase. The rest of the documentation below is to help group administrators. As a group administrator you have full control over the settings for your group. These settings are organised into a helpful tool called Group Settings, which will show you what options you have available. The other task you'll want to do when getting started is create accounts for your members. You can create new accounts from the account menu in the control bar. You can make a member inactive by un-checking the Active checkbox. This means they will no longer be able to purchase and won't receive invoices automatically from lettuceshare. 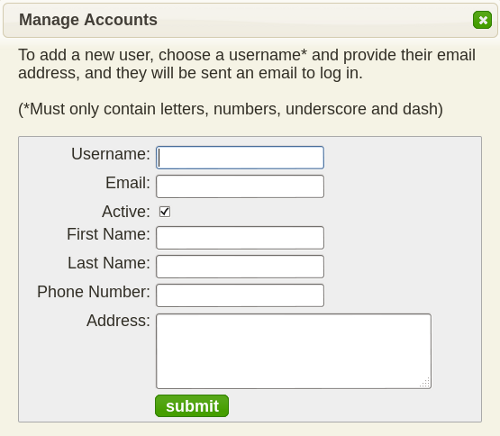 Once you've created new accounts, you can give permission to other users to access pages to perform specific tasks. 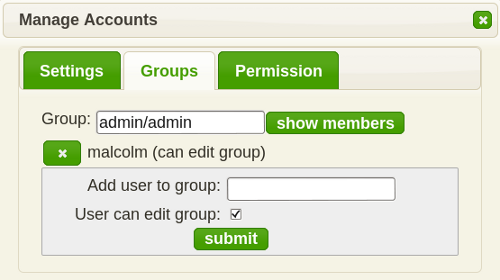 Adding a user to the admin/admin group allows them to also create new accounts. The tools mentioned so far have all been dialog based, which open on the page you are currently on. This next section is about specific pages you can visit using the page select menu in the top right corner of the control bar. The main pages you will use as a group administrator are the stock, manager and payments pages. If a user has permission to access these pages, they will be listed for them in the menu. The stock page is used to update stock availability and prices. It allows you to create new supplier accounts and can also import stock lists from some suppliers. To view the stock page, select stock from the page menu. The manager page lets you search the purchase history of your members, to make corrections when purchases need to be updated, added or removed. The manager page can also be used to create a set of items that are purchased together, these box items are then given their own price. The payments page is used to process payments made by your members. It also allows you to edit some of the payment settings that apply to your group. The payment page can import a wide variety of payment formats available to export from accounts with major banks. The report page gives you access to summary information for your group. You can use it to produce quarterly GST reports, follow quota allocations, and much more. This page makes your data searchable, so that you can track the progress of your group. Invoices are sent out automatically, but you can also choose to send them manually via the invoices page. This page also shows member balances, and provides a helpful reconciliation tool that downloads a member's purchase and payment history to show how their current balance was calculated. If your members volunteer for specific roles, the roster page allows your members to specify when they want to allocate their time. You can create your own roles and groups for use with the permission system. Extra functionality is available if required, this includes the shopping cart module and a point of sale system, both of which can provide credit card and PayPal as payment methods. The purchase page and point of sale can also work with integrated scales to automatically update the quantity field on the page as items are weighed. If you want to learn more about the Content Management System that runs this site, please visit dobrado.net. There you'll find more information on how to edit and upload content, you can use this knowledge to edit your own pages here on lettuceshare.org.